Just dashing into a little market for some water and snacks before hitting the road, I wasn’t expecting to find (and fall in-love) with a book! 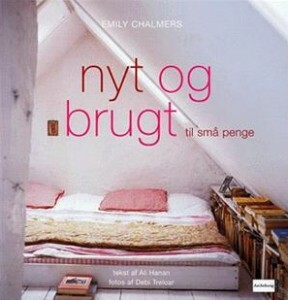 But when I saw the cover of “Nyt og Brugt” (new and old) by Emily Chalmers, I was instantly smitten and had to buy it – especially since it was on sale for 49kr ($8). Emily Chalmers is the author of another beloved book, Flea Market Style but I have to say, I think this one is much better. There’s a softness to it and the images (which I will try and show at a later date) are so beautiful, unique but actually very do-able. I’m keeping it under my pillow in hopes that all the knowledge will transfer to me via osmosis. It can’t hurt, right? I haven’t been able to find it for sale online anywhere (not even on the European sites) but have found a little information from the publishers. But now, reading more of it must wait as I’m heading to the grand casino. And if I win big there, I promise to buy you a copy of the book! Update: I only won enough money at the casino for one book but thanks to Dina who left information in the comments, you might be able to snag this book. It’s English version is called Cheap Chic and might be able to be found. I’d be very curious to see this book since the Danish copy lists lots of wonderful Danish stores at the end (do they list UK or American stores in the English version?) Happy hunting! This book i also want to buy! I am loving this hygge blog, I’ve just read all the feb and jan posts in one sitting. really it’s great, just what I needed on a day like today. I love CPH too, stay warm!